On bright, sunny days, a good pair of performance sunglasses can make the difference between a pleasant bike ride and a harrowing, dangerous experience. Your sunglasses can not only protect your eyes from sun damage, but also make it easier to spot hazards such as potholes and puddles. Today we’ll address a few important features to look out for when you’re shopping for new cycling sunglasses. First and foremost, your sunglasses should be able to protect your eyes from the sun’s harmful radiation. Before you purchase a new pair of sunglasses, make sure they include a “UV 400” label. This ensures that they will be able to block all UV rays with wavelengths up to 400 nanometers. In addition to anti-fogging coatings, some sunglasses also feature ventilated lenses and padded frames that prevent moisture buildup while you’re riding. This way, you won’t have to worry about your vision becoming obscured by a hazy layer of fog on long rides. Polycarbonate lenses are typically the best option for cyclists, because they’re able to resist damage from flying objects and impacts far better than glass. The color of your lenses can be an important consideration, too. 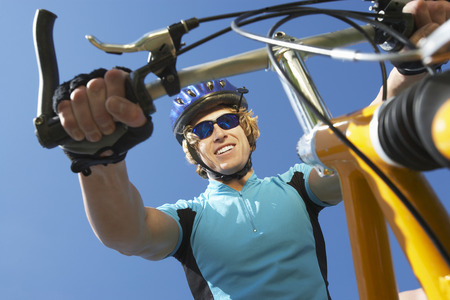 Dark gray and green lenses are ideal for riding in especially bright sunlight, for example, while yellow and amber sunglasses are better for riding in overcast conditions. Yellow lenses can also increase your vision’s color contrast and make it easier to see potential hazards in the road. Some performance sunglasses are available with interchangeable lenses to accommodate different weather and riding conditions. Finally, your cycling glasses should be able to fit securely on bumpy roads and remain comfortable for hours at a time. Make sure that your sunglasses can fit comfortably when you’re wearing a helmet, and look for rubber temple and nose grips that will keep them snug on your face when you start to sweat. Keep these guidelines in mind, and you’ll be able to find a great pair of cycling glasses that will serve you well for many years.